Today’s post is by Virginia Cover, Senior Pastor at Grace Lutheran Church in Camp Hill, Pennsylvania. Have you ever noticed that attendance of families with young children tends to be sparse on Good Friday? As a pastor, I have certainly noticed this, especially in our congregation where these same families readily attend worship. I have a few guesses for this absence. For starters, the Three Days has only recently been recovered and has not been talked about frequently where I serve. But there was more. I asked a few young parents why they stayed away from Good Friday in particular. They told me about services with loud crashing sounds, extended periods of silence (at 7:30p.m. 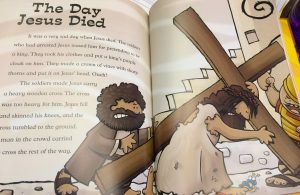 with an over-tired child), and detailed and gory depictions of the crucifixion. One of them told me how they tried to read the story of Jesus’ death from the children’s bible to their young son and he wouldn’t let Dad finish. He physically retreated from the book—the book he normally longs to read from. No parent wants nightmare-central on Easter weekend, and no worshipping community avoids confronting death either. What to do? As a parent of two young children myself, I began to consider a Good Friday service especially for kids. Another congregation in town was doing a “footsteps of Jesus” kid-friendly event on Good Friday, so why couldn’t we? But the more I planned a Good Friday for kids, the more I rediscovered that nothing is as powerful as the church’s own ancient way of enacting the Three Days: washing feet, eating the meal, stripping the altar, adoring the cross, praying for others, lighting a fire, inscribing a candle, sprinkling water, singing psalms, reading from scripture. There’s power in the Three Days when we hold them together. Children cannot hold the empty tomb in their minds while singing “how pale thou art in anguish/in sore abuse and scorn” in complete darkness. The adults weren’t holding it together either because the Three Days were so new, and they didn’t yet realize that missing one service meant leaving a hole in the story fabric. We now have a service every year on Good Friday designed especially for children, yet it involves adults, too, and holds the Three Days together. We lay out a “highway” story map with items representing the high points of the church’s liturgy around the Three Days, telling the biblical story and the liturgical story together as we place each piece on the roadway. Then we spend some time floating through stations that go deeper into each day’s elements: a play dough mat connects the Last Supper to other special meals, a Good Friday sad touch and feel table (nails, rough hewn cross, crown of thorns) with a reflection sheet and coloring page of the Inside Out(Pixar, 2015) character Sad, an art project that when finished reveals a surprise (like the women discovered when they came to the tomb), and so on. One station is dedicated to putting the story in sequence to take home and tell again, either in the form of “story eggs” or watercolor paintings. We close with a taste of Easter in song, scripture and food—we eat “resurrection rolls” put together earlier at one of the stations—a sweet, Alleluia ending to our Three Day exploration. You can read more about the service here. What I have loved the most about this experience is how the children teach us the important things. To date, the most popular stations are not play dough or art projects but the foot washing. 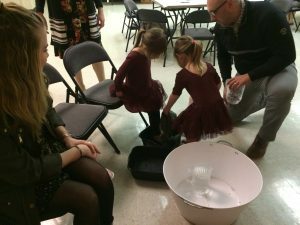 The children know what to do by heart: hold the heel, pour the water, wipe the feet—and they wash and are washed with eagerness and joy every year.